Pope Benedict's decree on the revival of the Latin Mass has sparked a hunt for pre-Vatican II chasubles, birettas, burses and other now rare items required for celebration of the Tridentine rite. Reuters reports that the pope's recent decree allowing wider use of the old Latin Mass has spawned a veritable cottage industry in helping Roman Catholic priests learn how to celebrate the centuries-old rite. A website, helpline, DVDs and a training course at Oxford are among resources springing up for priests who want to celebrate the old-style Mass but aren't sure which vestments to wear or where to get them, when to genuflect, how deep to bow, or how to clasp their hands in prayer. "There will be priests who will say: 'Oh my God, I want to celebrate the old rite but I'm not sure of one or two things'," said Pietro Siffi, a 37-old Italian devotee of the old Latin rite who plans to offer free online and phone support. "We will help them find the answer." 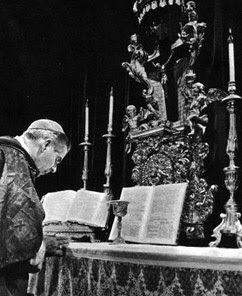 Before the Second Vatican Council (1962-1965), Catholic Mass was an elaborate ritual led in Latin by a priest who faced east with the rest of the congregation, meaning they faced his back. Vatican II reduced the formality and had the priest face the faithful to pray in their local language. The old rite also includes hair-splitting specifics on which vestments can be used, what material they must be made of, where the candles should be placed on the altar, and the precise position of the priest's hands at various points in the liturgy. The Society of St Pius X, the traditionalist rebel group whose leaders excommunicated themselves from the church after they disobeyed the late Pope John Paul II, has a self-teach option. It has produced a slick DVD in eight languages showing a priest celebrating the old rite with a running commentary on everything including the precise position - down to centimetres - of the priest's hands, altar cloths, chalices and candles. It tells the priests the exact order in which to don the several layers of vestments. An X for "no" suddenly appears on the screen when the priest makes a false move. And Siffi plans to expand his website to help priests find the right equipment. He may also offer courses, which will be charged at cost. "I'm not in this to make money," he said. "This is a labour of love." Soffi and others say there is today a growing interest in the old rite from young people disaffected with a superficial, consumerist world and looking for something sacred.After the old rite was phased out to be replaced in some churches by sing-along hymns and guitar music, many people missed the Latin rite's sense of mystery and awe and the centuries-old Gregorian chant that went with it. But finding equipment remains a challenge, according to Reuters.After the changes in the 1960s and 1970s much of the material was thrown out, sold to antiquarians or stashed away in dusty cupboards of rectories or church attics. One hard-to-find item is the "burse": a stiff, cardboard pocket between nine and twelve inches square. 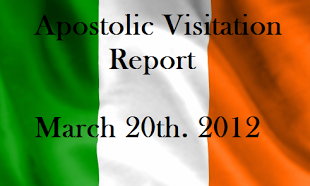 It must be covered in silk and of a colour to match the Mass vestments. The black biretta, a square cap worn by the priest celebrating the old rite as he approaches the altar before Mass and on leaving at the end, also fell into disuse.